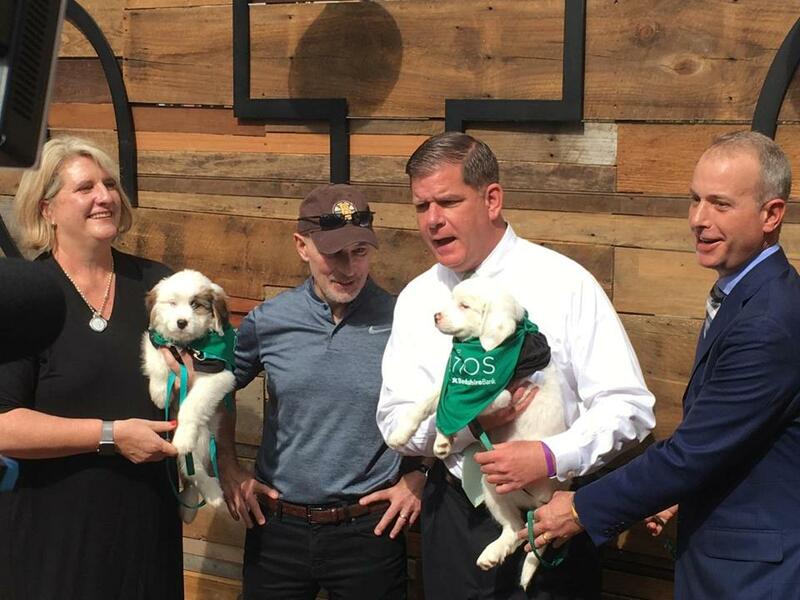 Boston Mayor Marty Walsh held a puppy during the opening ceremonies for “The Patios” on Boston City Hall Plaza last May. Starting May 2, Boston’s City Hall Plaza will once again host The Patios — which last year enticed large crowds with the promise of puppies, ice cream, mini golf, and beer — with some new additions that are sure to delight visitors. The Patios, located at the southeast corner of City Hall Plaza, overlooking Faneuil Hall, features a series of custom-made patios and a main pavilion, spaces where people can gather together for food trucks, drinks, and “pop-up” displays. The Patios is the result of a partnership between city officials and Boston Garden Development Corp., and is presented by Berkshire Bank. For its debut last year, the seasonal event featured Wachusett Brewing Company’s “Wachusett Brew Yard,” putt-putt mini-golf, and “Wag Wednesdays,” when puppies were brought to the site from a Dedham shelter for people to play with and adopt. This year, a few more amenities are being added to the mix. The new additions will include “Sunday Grilling,” where four electric grills will be set up on site — free of charge — for people to use on a first-come, first-served basis. Visitors are welcome to bring coolers filled with accoutrements and food to the plaza, or buy hot dogs and hamburgers on site from a local vendor, according to a statement. Wachusett Brewing Company will once again have beers on tap. But new to its lineup of drinks will be the company’s Scratch Cocktails Margarita — “a refreshing, tangy, and tart creation perfect for patios season” — as well as the company’s new hard cider. The brewery will also bring back its “Guest Tap” series to feature other local brewers throughout the summer, as well as Nauti hard seltzers and locally based Archer Roose wines. Additionally, officials said, The Patios themselves will be fully equipped for “bringing the office outdoors.” Each of the nine patios will be outfitted with power outlets, and the Wi-Fi networks have been upgraded, officials said. The food truck options will also be getting an evening extension, to cater to those who have a hankering for grub after work. The trucks this year will be available daily 11 a.m. to 3 p.m. and 5 to 8 p.m. Monday through Saturday, and will include Maria’s Taqueria, Mediterranean Home Cooking, Trolley Dogs, Roxy’s Grilled Cheese, Clyde’s Cupcakes, and Tacos Don Beto, officials said. And Bittersweet Homestead — a local food company based out of Westminster — will get a larger pop-up location at the front entrance of The Patios, and will operate seven days a week. The expanded menu will feature coffee, tea, and fresh-squeezed lemonade, as well as hot dogs, Italian sausages, and desserts. And don’t worry, dog-lovers: Wag Wednesdays are coming back, too. The event will take place 12 to 2 p.m. each Wednesday. “In 2018, Wag Wednesdays at The Patios resulted in more than 200 adoption applications and nearly 30 pups being placed with their forever families,” officials said in the statement. Putt-putt mini-golf holes will once again be free for public use seven days a week, and additional activities will be added throughout the season, officials said. “From workday meetings outdoors to a spot for weekend grilling with family, we are proud to provide one of the most versatile and welcoming outdoors spaces in Boston,” said Amy Latimer, president of Boston Garden Development Corp., in a statement.